"The Vicair Vector O2 is wonderfully airy, so you will sweat less"
I am 24 and have been in a wheelchair for 4 years now. 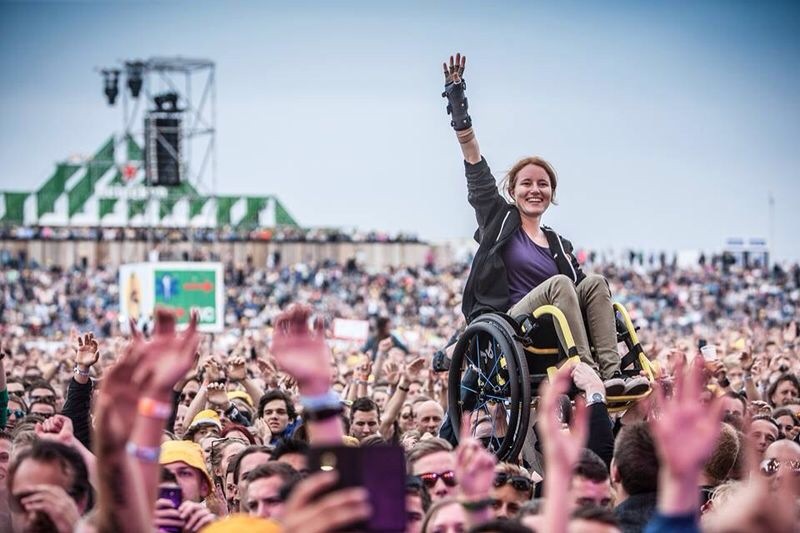 This wheelchair expanded my world after a period in which I was diagnosed with and treated for pyelonephritis (inflammation of the renal pelvis), because of which I suffered from drug toxicity, that in turn damaged my vestibular system, leading to a loss of muscle control and sensation in my legs (at least, that is the theory). My condition didn’t fit into a standard category, which made it hard to receive reimbursement for the equipment that I needed. This meant I had to sit on a standard wheelchair cushion for a long time, causing skin problems and spasms. Since a few months I have been the proud owner of a Vicair cushion, ‘what a relief is air compared to foam’. I chose a 6 cm high cushion, because my wheelchair back is very low and my entire wheelchair is setup for a low seated user. The 6 cm high cushion has slightly less positioning possibilities than a 10 cm high cushion, but that hasn’t been a problem. My choice for the Vicair Vector O2 was not a random choice. Vicair was advertising the special feature the Vector O2 cushion has: it can be machine washed. And if you are a healthcare professional, like I am, that is a very handy feature because when you work in healthcare institutions everything needs to be as hygienic as possible. So the idea of being able to simply put the entire cushion in the washing machine was very appealing. I found that next to this great feature, the Vector O2 is wonderfully airy, as in: the cushion is breathable so you will sweat less. Both features are of great use in the Netherlands, because when it’s rainy outside the cushion is able to get wet but dries fast. This comes in especially handy when you are an outdoor-person like me. 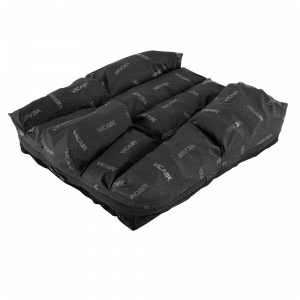 And when I think to take the spare cover that is provided with the cushion, I will always have a dry cover for the cushion. Sitting on air, what more could you ask for? these cells may feel a bit strange, but they soon settle into position and then the cushion precisely shapes to your body. That’s just perfect! So I am sitting on air and dry and without spasms, but the best has yet to come! Here in the Netherlands, the “Vicair Probeer Service” [a Vicair cushion try-out service provided by Vicair only in the Netherlands – Ed.] allows you to try the cushion for 3 weeks without any obligations. Without this service I probably would now be ‘stuck with’ the Active cushion, although there was another cushion that suited me much better. Because I was able to try the Vector O2 for a little while, I now have a cushion that is perfect for me and fits perfectly into my current wheelchair. I very much value my independence, so I loved that I could simply receive and send the try-out cushion by post. No inconvenient other parties involved in the process. This way I could easily find out which cushion suited me best, before I purchased it. During the try-out period I frequently contacted Vicair. I very much enjoyed communicating with the Vicair team, as they made me feel that they cared for me as ‘a person’ instead of treating me like ‘one of many’. The only thing I miss when using the Vector O2, is the small pouch for my bankcards that my former cushion did have. But as this is the only small disadvantage of the cushion, I consider myself to be very lucky to own the Vector O2.